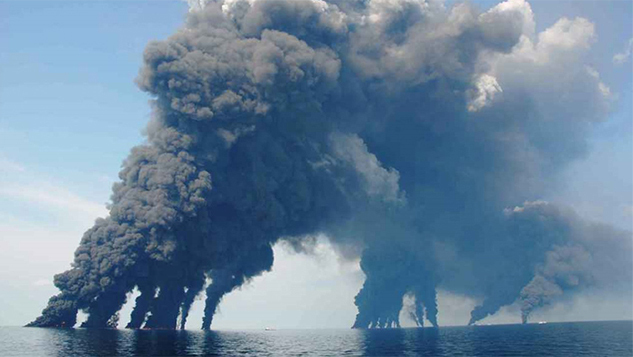 2010 BP Spill in Gulf of Mexico – How Big Was It? 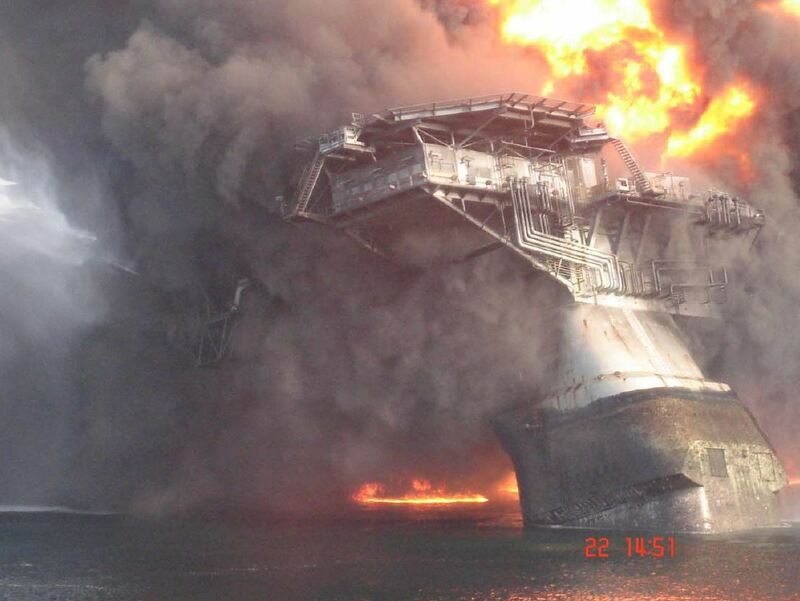 Final moments of the doomed Deepwater Horizon drill rig, April 22, 2010. A judge in New Orleans is now pondering a big-money question: how big was the 2010 BP oil spill? Exactly how much oil gushed into the waters of the Gulf of Mexico throughout the relentless summer of the BP / Deepwater Horizon oil (and gas) disaster? The Summer of Spillcam? Thar she blows: BP spill cam, May 30, 2010. Despite the government shutdown, lawyers from the federal Department of Justice are duking it out in court against a team of BP attorneys. At stake: billions of dollars in fines levied under the Clean Water Act, which are calculated based on the amount that was spilled. The feds say BP spilled 4.2 million barrels (176.4 million gallons); BP says it was much less, about 2.45 million barrels (102.9 million gallons). If the judge rules that BP has to pay the full $4300 fine per barrel for gross negligence, that’s a whopping difference of $7.5 BILLION. Congress passed a law called the RESTORE Act that will send 80% of the fine to the affected Gulf states, in part to conduct ecosystem restoration projects to repair damage from the spill; if BP’s lower number prevails, that’s $6 billion less for restoration work. SkyTruth played a part during the spill to shed light on how bad it actually was. When the Deepwater Horizon exploded in flames, we began collecting and analyzing daily satellite imagery, and publishing maps of the growing oil slick. A Gulf oceanographer, Dr. Ian MacDonald (then at Texas A&M, now at Florida State), saw our images and slick-size measurements and suggested that BP and Coast Guard estimates of the flow-rate of oil from the well must be far too small to result in such a large and rapidly expanding oil slick. On April 27, 2010 – three days after the Coast Guard announced the Macondo well was leaking – we published on this blog our first estimate that the flow rate was at least 20,000 barrels (840,000 gallons) per day: 20 times greater than BP and the Coast Guard were saying. Here’s a timeline of the flow-rate estimates made for the Macondo well in the first two weeks of the spill (some of the links to news accounts may no longer work). 5/1 – Coast Guard and NOAA cease estimating the rate of the spill. BP continues to use 5,000 barrels per day as their estimate of the spill rate. On May 19, NOAA and the USGS convened a panel of scientists, dubbed the Flow Rate Technical Group, to measure the flow rate using several different approaches. On May 27, more than one month into the disaster, they issued their first preliminary estimate of the spill rate. 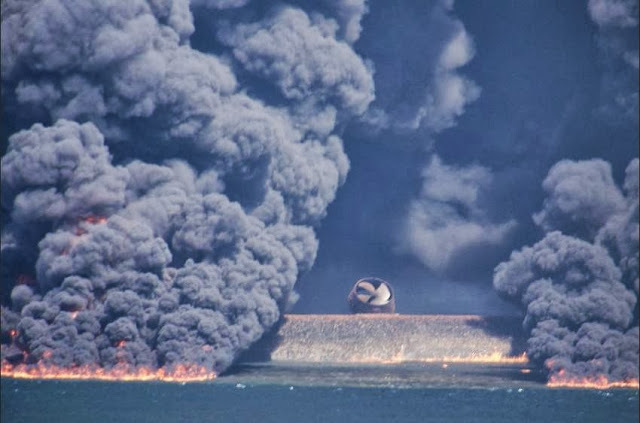 Subsequent estimates were much greater; their final estimate was a flow rate of 62,000 barrels per day at the beginning of the spill, tapering back to 53,000 barrels per day by the time the well was finally capped on July 15, 2010. Some, including scientists on the Flow Rate Technical Group, claim even these numbers are too low. So watch closely. The judge will be bombarded by highly technical expert-witness testimony from both sides. The complexity, and lack of absolute certainty with any indirect measurement technique, favors BP: it’s likely the judge will ultimately make some kind of compromise, and the final for-the-record number will be based on a mix of politics, confusion and fatigue more than on actual science. https://skytruth.org/wp-content/uploads/2013/10/deepwater_horizon_sinks_NYTimes_26dec10_2.jpg 423 640 John Amos /wp-content/uploads/2016/08/test_logo.png John Amos2013-10-01 20:17:002019-02-14 11:30:492010 BP Spill in Gulf of Mexico - How Big Was It? The federal trial to determine accountability and penalties for the BP / Deepwater Horizon oil and gas disaster in the Gulf of Mexico was set to begin in New Orleans this morning, but has been delayed by one week to allow more time for BP, the feds, and other stakeholders to reach a settlement. Deepwater Horizon rig sinking on April 22, 2010. We appreciate that the many businesses and families harmed by this massive industrial accident may want to receive compensation sooner rather than later. A trial and the inevitable appeals would likely stretch on for years, with the outcome uncertain. 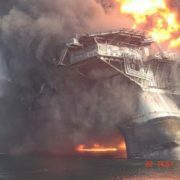 On the other hand, a quick settlement is the best outcome for BP, because they may avoid having to pay the higher $4,300-per-barrel-spilled fine for “gross negligence,” and would only face the much lower automatic fine of $1,100 per barrel. Given a total spill of 172 million gallons (4.1 million barrels), that’s a very big difference: $4.5 billion instead of $17.6 billion. Even a company as large as BP, which earned profits of $23.9 billion in 2011, would feel some pain from the gross negligence fine. 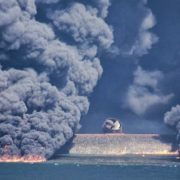 And unless they feel real pain, the offshore drilling industry is likely to continue doing business as usual, making another massive deepwater spill a near certainty. More important than meting out sufficient punishment: there is bipartisan legislation in play called the RESTORE Act that would specifically allocate 80% of the fine to the Gulf states affected by the spill, rather than the general treasury. We assume (optimistically) much of the money would be used by those states to fund social, economic and ecosystem revitalization projects. If the Act does get passed by Congress, the additional $13.1 billion yielded by a determination of gross negligence could make a huge difference to Gulf communities. Just how risky is modern offshore drilling? A trial may be the only way to answer that question, so we can make better-informed decisions that minimize the likelihood and impact of the next big spill as industry moves steadily forward with deepwater drilling. 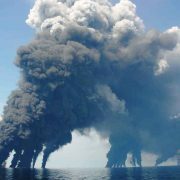 Fire Reported in Gulf of Mexico – Part Deux? 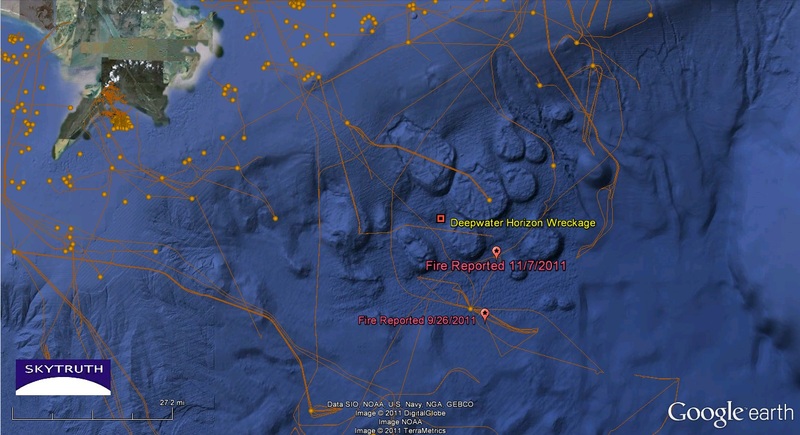 Location of fires in the Gulf recently reported to the National Response Center in the general vicinity of the Na Kika deepwater development project operated by BP and Shell. 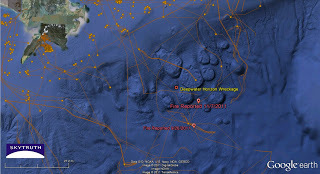 Platforms are orange dots; seafloor pipelines are orange lines. Location of Deepwater Horizon wreckage shown for reference. Once again an airline pilot (or observant passenger) has reported seeing a fire in the Gulf of Mexico. 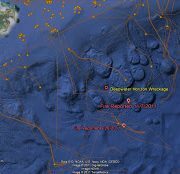 This was reported to the National Response Center at about 8:19 pm on November 6, at a location in the deepwater Gulf about 12 miles southeast of the site of last year’s BP oil spill. It’s also about 11 miles north of a fire reported on September 26 that we covered in this blog. Both reports are in the general vicinity of the Na Kika offshore development project operated by BP and Shell. We think these observers may be seeing flaring of natural gas during drilling operations. We’re not sure what, if any, drilling activity is occurring here right now (if you know, please let us know!). If they are flaring “commercial quantities” of natural gas, that could be illegal – Shell got busted for doing this a few years back in the Gulf at their deepwater Auger platform about 140 miles offshore, and got fined to the tune of $49 million by the US government. We don’t know if that’s what is happening here. But we wonder if anyone at BOEMRE is paying attention to this. https://skytruth.org/wp-content/uploads/2011/11/SkyTruth-NaKika-fire-7nov2011-map.jpg 174 320 John Amos /wp-content/uploads/2016/08/test_logo.png John Amos2011-11-10 20:26:002019-02-22 11:08:44Fire Reported in Gulf of Mexico - Part Deux? The film will be followed by a panel discussion with none other than our own SkyTruth president, John Amos, as well as Doug Inkley of the National Wildlife Federation and Joel Achenbach of the Washington Post. Joel is also author of a riveting book about the spill, A Hole at the Bottom of the Sea. As if that wasn’t exciting enough, if you DO come out to the Opera House, don’t forget to set your DVR’s and Tivo’s for the SkyTruth interview with West Virginia’s PBS. Our segment will be shown on Friday night’s episode of This Week In West Virginia, which will be airing at 8:00 p.m. If you miss that airing, don’t fret! Another airing will be shown on Sunday, November 6 at 6:00 p.m.
https://skytruth.org/wp-content/uploads/2011/11/acff_logo.jpg 97 200 Teri Biebel /wp-content/uploads/2016/08/test_logo.png Teri Biebel2011-11-02 18:16:002019-02-22 11:13:00Friday Night Appearances!